In 2016, the Congress in Brazil decreed the 1961 Hague Convention Abolishing the Requirement of Legalization for Foreign Public Documents, which means that this country is now accepting and issuing Apostilles as a simplified form of legalisation and no Embassy or Consular process would be required anymore. The Hague Convention simplifies the inter-exchange of public and private documents between Brazil and other countries that are also members of it, this also facilitates commercial transactions and other legal processes between countries. In the past, all documents that were going to be used in Brazil, needed to be submitted to the Embassy or Consulate after being processed by the notary, Clerk, Secretary of State and sometimes the Department of State. Currently, with the entry of Brazil to the Hague Convention for the Apostille, documents will not need to go through this long and complicated process, they will only need to be Apostille by the State where they were issued or notarized. Such documents are University Diplomas and Transcripts, Powers of Attorney, Commercial and Corporate Documents, Birth, Death, Marriage and Divorce Certificates, Invoices, Police Criminal Background Checks… to mention only a few ones. 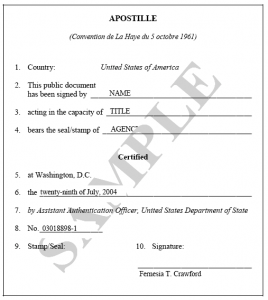 Federal documents will need to be Apostille by the US Department of State. This applies to FBI Background Checks, FDA Documents, IRS Documents, Naturalisation Certificates, Pattents and Assignments, Born Abroad Certificates, Consular Notarized documents, among many others. In general, this accomplishment really works in favor of both Brazil and the United States, as well as many other countries that also have business in common with this very important and prosperous country. For more information on how to get your documents apostilled for use in Brazil please write us to brazil@apostilla.com we’ll be very glad to hear from you.